Very cute watch! It fits well and looks good on. 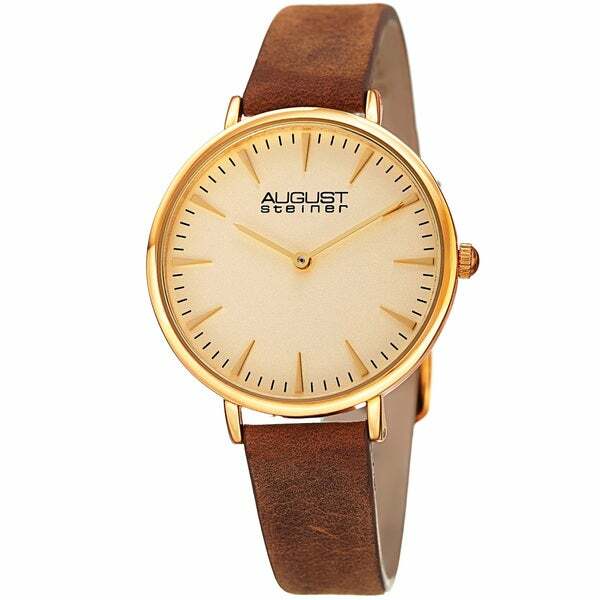 There doesn't seem to be too many choices if you look for a watch that has a gold-tone face with a leather strap. This August Steiner women's timepiece features an admirable classic design: a slim case and a beautiful matte dial with hand-applied markers. This watch is adorned with a lovely leather suede-look strap and is powered by a highly accurate Japanese quartz. This year's trend appears to be very large faces on watches -- this one is large. I ended up sending it back because of that. If you like large faces, this one was pleasing to the eye otherwise: nice colors, liked the strap color, etc.